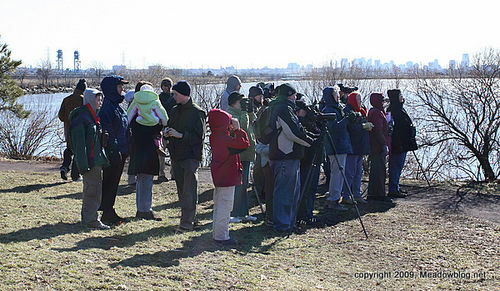 We had a terrific turnout for our GBBC walk at DeKorte Park and environs this morning — nearly 30 birders of all ages who braved some serious winds to record a whole lot of birds. Some of the highlights included a Snowy Owl, a Red-shouldered Hawk, Pintails, Canvasbacks, Green-winged Teal and a Ruby-Crowned Kinglet. Not excatly chopped liver. We will post a full report Tuesday or Wednesday of next week. Thanks to all who participated today. After a long freeze, the tidal impoundments at DeKorte Park are thawing, and the waterfowl are returning to the impoundment by the Environment Center (above). It was still ice as recently as Wednesday. A couple from Central New Jersey visited the Meadowlands this week in hopes of a fulfilling their longtime dream of seeing a Snowy Owl. They stopped by the Environment Center, a naturalist took them to see the owl, and they hung around to see other raptors. They got an added owlish treat at the William D. McDowell Observatory. Not only did they see their Snowy, but near DeKorte Park in Lyndhurst they also saw a Short-Eared Owl (above), the local American Kestrel, and Rough-legged Hawks and Northern Harriers. While at DeKorte Park, they met John Sloan, who runs the observatory, and stayed around for the free public telescope viewing hours (7-10 p.m., Mondays and Wednesdays — and got to see the Owl Star Cluster. 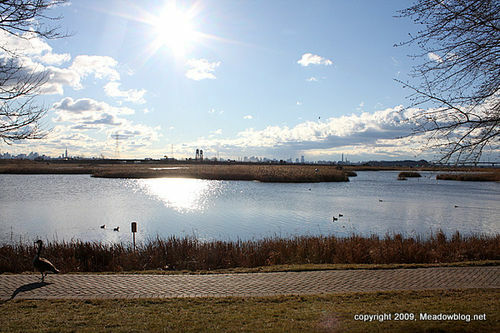 Please visit the Meadowlands yourself — for the owls, the observatory and more. 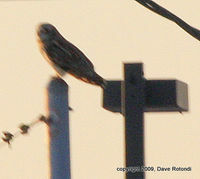 Click "Continue reading …" to see a link to a photo of the Owl Cluster and more information about it."